The cemetery is a self-contained battlefield that abounds with undead of types the heroes have never seen, each with its own special plan for escaping its eternal confinement. 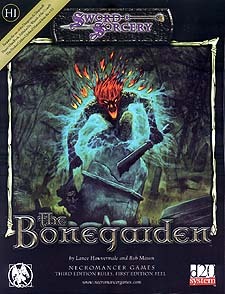 The Bonegarden contains dozens of new spells, feats, monsters, and magic items. All the action takes place inside a mile-wide arena where the dead are the majority and the living are hunted like wild game. The heroes have come to the cemetery in search of adventure. The only question is... can they get out?